Did you know you're about to become a serious player in the Internet Marketing arena?.. I'm not kidding, if you've ever wanted to 'Go Big' with membership marketing but have been put off by the costs, the time and the amount of hard work involved then I guarantee you are going to love this page! You see I've decided to hand over the reseller licences to not 1 but 10 fully loaded membership sites, each one is built around the hugely profitable and "freemium" based model - These things are as good as money in the bank! There's a smorgasbord of powerful monetization features built into the sites, you can go live TODAY and they're making money right now for the resellers who have already taken advantage of this offer. No kidding - this is as 'hands free' as anything you'll ever see online - And the result is you get to bypass the learning curve, eliminate the costs, save months, (perhaps years), of development time and just get started today! It's ALL done for you from the tricky behind the scenes programming through to the high quality reports, audio and video content - nothing's been left out it's all here! ** Yes it's true... In addition to the membership fees and upgrades payments that'll soon be heading your way, you'll also get extra cash from the affiliate promotions regularly sent to members for you. So yes even the back-end marketing is done for you! - In fact, any time an email goes out to members it will have your affiliate link embedded in it. Get ready to watch your affiliate commissions EXPLODE! Your Name On Each Site: Over the years I've found that the best way to improve your online branding and boost your 'brand' status is to run a high quality membership site. When you're the face of a popular site you instantly become the expert and the 'go-to-guy'. Use these ad spots to cross-promote your other new membership sites [you will be given 3 eye catching banners for each of your 10 sites]. Or use these premium ad spots to promote your other products, your favourite affiliate programs - in fact anything you choose! The bottom line is you get the profits - not me! Set Logout Links To Your Own Sites: Logout links are worth their weight in gold. 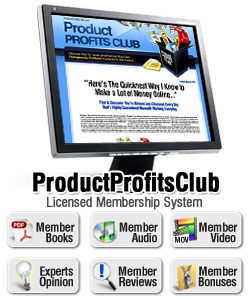 Each year I generate thousands of dollars from 'exit' traffic across my membership network. And this little known money maker has been incorporated into the system for you. Just select the site you want people to see when they leave your member's area and the rest is done automatically. Use this to drive tons of traffic to your blog, your other sales letters, your affiliate links - Anything! Complete Ready Made Marketing Pack: You'll also get all the tools, gadgets and gizmos you could ever need to promote your sites. For each site you'll receive - 2 squeeze page systems (use these to capture leads before providing memberships) There's a long form squeeze page and a highly optimized hybrid version that's been tested with some pretty amazing results. Also included is a collection of articles, blog posts, banner ads, tweets, keyword research and thank you page bonus graphics - All you need to drive thousands of people into your sites. And the whole process is simple... You login to your secure control panel, enter your data and click save. That really is all you need to do. You can start bringing in new members on multiple sites in less than an hour from now. 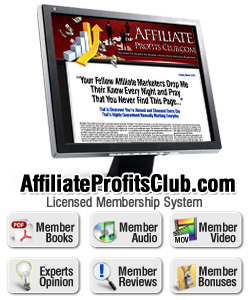 With AffiliateProfitsClub you can train your members how to finally win the affiliate game and position yourself as the 'Go To Guy' helping thousands of people get their big break in this exciting business. With eMarketersClub you can teach members how to build, how to grow and then how to maximize their profits from their email lists... As a result you can expect to mop up big profits and build a legion of raving fans! At MembershipMarketersClub you'll be sharing everything your members need to know about market research, set up and choosing the right software all the way through to pricing strategy, membership models and retaining members. 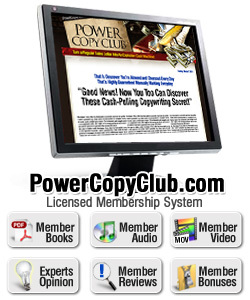 Your members will love the information in PowerCopyClub because everything they learn will boost their sales and income - Everything's covered from crafting short copy, long copy and how to do video sales letters the right way. 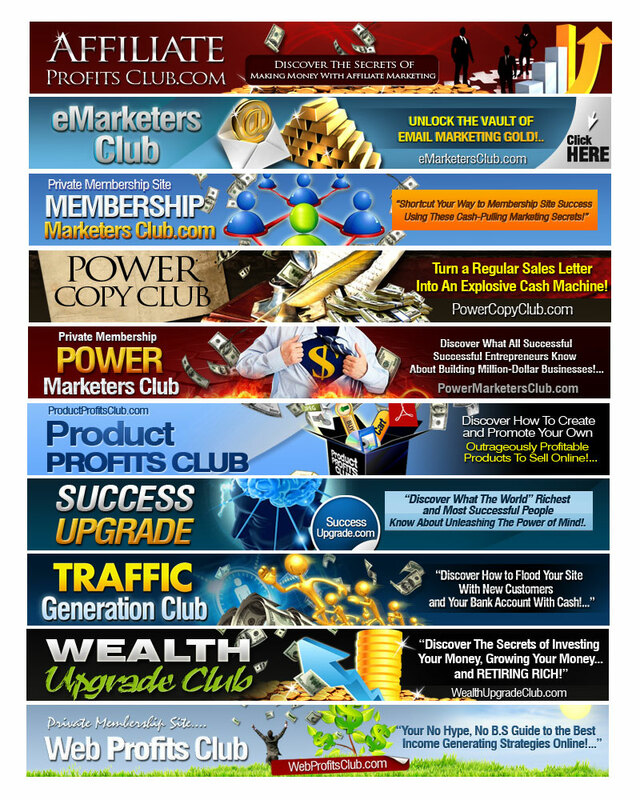 At PowerMarketersClub you'll be sharing many advanced marketing techniques, including how to create profitable sales funnels, successful business Models along with solid information about on testing & tracking and exit strategies - packed full of advance level tips & tricks. Without traffic business owners are dead in the water but now you can help them. 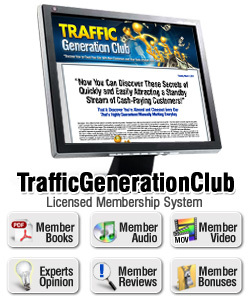 With Traffic Generation Club you can satisfy this huge demand and teach thousands of site owners how to get what they need the most... more quality traffic to their sites. If your goal is to help people succeed and to develop long term relationships with your customers then helping them find safe passage through these shark infested waters should be a number one priority. 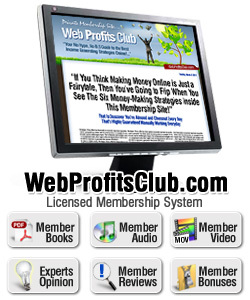 With Web Profits Club you can do just that and in the process capture an endless stream of buyers who'll likely become devoted fans for life! Legal (Asset Protection-Formations) / Taxation / Investments Through to Product Licensing, royalty payments and other long term income strategies for successful people. To keep members coming back for more (and upgrading and clicking your ads) they'll receive regular emails, fresh articles & tips, extra reports, site updates and free bonuses all designed to hold their interest and provide incredible value in their membership. However that's often the reality of running your own membership site. Support can eat away into your profits and it can take a lot of the fun out of running a site. That's why I'm including full professional support for all your members via our state of the art, white label support desk. We take care of it for you and make you look great. You'll discover when you join us just how easy we've made everything. Don't worry if you're just getting started because there's no guesswork involved here at all! Just like me, you're going to jump for joy at the simplicity of this 'plug & play' system. You can simply slot these sites into your existing business in a few minutes and you'll be ready to rock and roll. You can start adding thousands of extra dollars in easy profits to your existing business from the minute you get started! NO RESTRICTIONS: Rest assured there are NO hidden limits to how many new memberships you can sell. The network effect really ramps up your earnings potential but remember it also ramps up the costs involved and when you factor in all the additional day to day running costs including member support it's not a stretch here to suggest that 10 sites like these would set you back somewhere between $50,000 - $100,000 in set up costs. "This is a fantastic business opportunity for anyone, newbie or otherwise, looking for a shortcut to build their lists and bring cash into their business almost straight away. The automated, plug & play features are a masterstroke, these membership sites are pure art, with every angle covered." 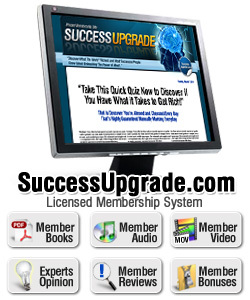 "I have always been impressed by the incredible value you pack into your products and membership sites, but this is probably the craziest offer I have seen ANYWHERE online. Setting up the membership site, creating its content, and handling the customer service issues that go along with it can be an EXTREMELY daunting task for most of us, which is why so many people have membership ideas instead of membership sites. You've removed the excuses and barriers most people have and made it SUPER simple to start earning an income almost right away. 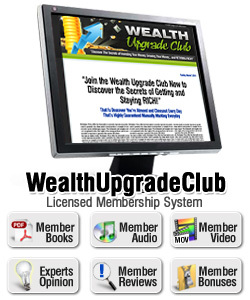 I am BLOWN AWAY by how powerful this system is and the earning potential it provides." "Anyone sitting on the fence wondering if they should purchase shouldn't give it a second thought. This is the ultimate business in a box - like a franchise but even better. If you ever wanted to start your own business now is the time because you get everything you need!" "When I logged into the control panel I couldn't believe how well thought out and beautifully put together everything was.... what a first class act! This is an absolute no brainer... Do yourself a HUGE favor and give yourself this incredible gift. I guarantee you will not be disappointed." ... With everything done for you... full white label member support, autopilot affiliate promotions etc. then you probably agree that anything less than $1,000 is a deal you want to say 'yes' to! But if all of this could be yours for even less than that, say $797 you'd probably think I was losing my marbles right? Please Note: Platinum Account / Reseller Memberships Are Set Up Manually After Payment Is Received. This Process Usually Takes 24 Hours - After Your Successful Transaction Further Information Is Provided. PRICE/OFFER IMPORTANT: As you can imagine chopping over $1,000 of my prices isn't the most profitable way to run a business and I simply cannot make this offer at this low price a permanent fixture. So to guarantee the $497 price you should secure your license right now. If you wait I guarantee this will probably be gone and not repeated. P.S. The only way you can lose here is if you walk away empty-handed... This really is the easiest route to get all the benefits of owning a huge network of memberships sites without any of the hassles and stress that usually come with it. By taking action right now not only are you making MASSIVE savings you're eliminating a minimum of 12-18 months of hard slog attempting to put something like this together yourself. Act now and you'll be in business today! PRODUCT GUARANTEE: I'll be totally straight with you here... If you plan on purchasing then asking for a refund, please don't order a license. This is a very limited offer, so if you are not 100% committed then leave the license for other resellers who are and who will put it to good use. I only want to work closely with serious marketers and genuine folks that are ready to take their business to the next level. But because I want you to start today with total peace of mind your investment is backed up by a full 30 day money back guarantee - You will be ordering with confidence and this eliminates any kind of risk on your part. "I'm always on the lookout for automated income sources and plugging this into my biz was a no brainer. It generates a few hundred bucks every month for me, completely on auto-pilot. Thanks for a fantastic plug-in profit generator!" Copyright by Count On Us, LLC - All rights reserved.